Thymus serpyllum, known by the common names of Wild Thyme or Creeping Thyme is a species of thyme native to most of Europe and North Africa. It is a low, usually prostrate subshrub growing to 2 cm tall with creeping stems up to 10 cm long, with oval evergreen leaves 3-8 mm long. The strongly scented flowers are either lilac, pink-purple, magenta, or a rare white, all 4-6 mm long and produced in clusters. The hardy plant tolerates some pedestrian traffic and produces odors ranging from heavily herbal to lightly lemon, depending on the plant. 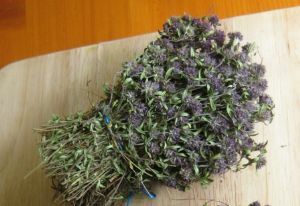 It is part of the Lamiaceae family, and is related to the mint and Dead Nettle plants. It is a source of oil of Serpolet by distillation, and is used as an aphrodisiac in herbal medicine. It is also used against coughing. It is used as a seasoning for many meat dishes (being commonly used in beef stews), cabbage or green salads, and vegetable dishes containing zucchini and eggplant. The dried leaves are used for a herbal tea throughout Europe and the United States.